These free form arcs attached to a single solitaire are symbolic of two hands embracing something pure and radiant as God's love and tenderness towards us. Measures 12mm wide (just under 1/2") x 20mm tall (just over 3/4"). Set in 14k solid yellow gold. 14K Yellow Gold Box Chain included in 18" (other lengths available by request). 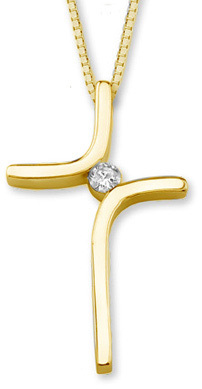 We guarantee our Diamond Solitaire Cross Pendant, 14K Yellow Gold to be high quality, authentic jewelry, as described above.